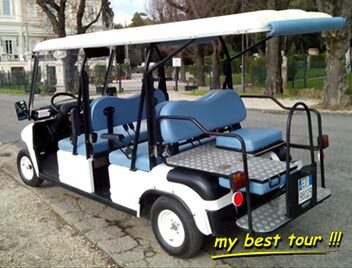 Rome by golf cart is private tour, we don’t put groups together. 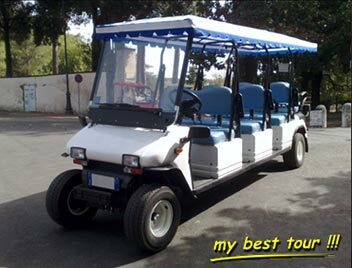 The itinerary for the golf cart tour is not preset, it can be discussed with the driver-guide the day of the tour so to avoid overlapping and repetitions. 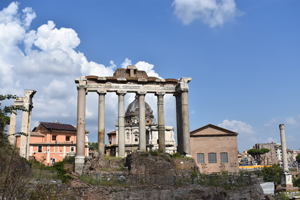 If you’re in Rome for the first time, we suggest the tours that cover Rome’s major highlights in the golf cart, if instead you are familiar with Rome, and there are some sites in particular you want to see, we’ll help you design your own tour! 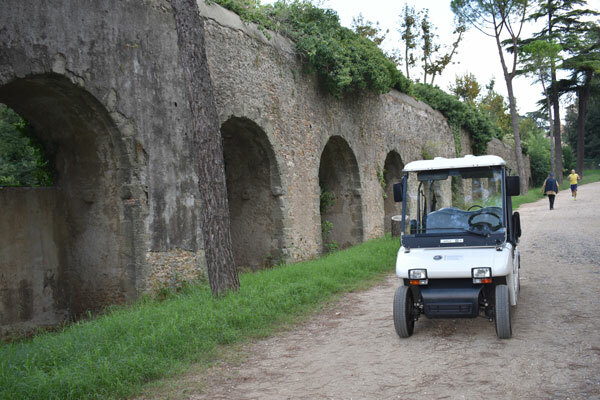 We have daytime golf cart tours of Rome lasting 4, 6 or 7 hours and 2-hour night tours. Our half day golf cart tours start at 9:30 am or 2:30 pm. Our 6 and 7-hour tour can start at the time you like. 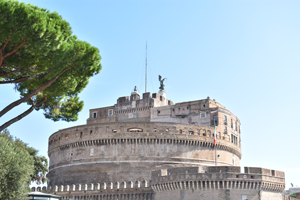 The 4-hour golf cart tour can also be combined with a walking tour of the Vatican (including Museums, Sistine Chapel and St. Peter’s Basilica) or a tour of the Colosseum and Roman Forum. Please visit the section hereunder to get an idea of what you can see in 4, 6 or 7 hours. Tour in our golf carts! They are electric, quiet, environment friendly, comfortable and small, so they fit everywhere. The golf carts are fully open, which makes them easy to get in and out of, allows you to take pictures without getting out of the cart if you don’t want to. They slip silently through the narrow streets where regular cars do not fit and get you very close to places that otherwise would not be accessible. 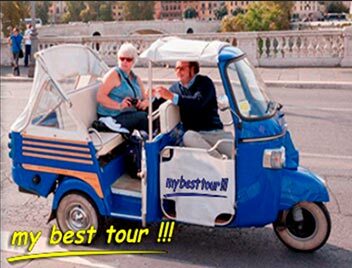 They combine the features of a walking tour to the comfort of a driving tour, adding lots of fun to your sightseeing! 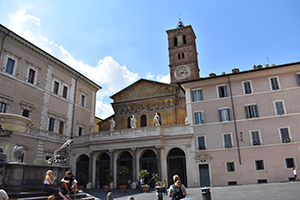 A walking tour would wear you out, take a long time and not cover much ground, touring by car you cover more ground but forcibly miss the most representative areas of Rome because cars can’t drive the narrow streets or easily find a space where to park. 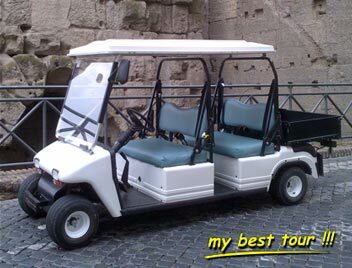 When you tour in a golf cart, you sit comfortably in a fully open electric car and let us guide you silently through the wonders of Rome. 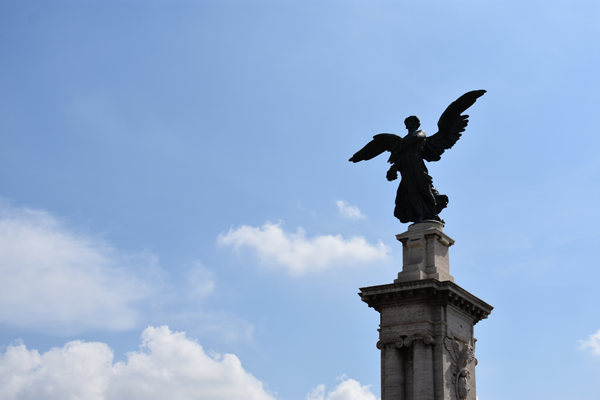 We’ll show you the main attractions as well as the out of the way sites, the ones normally tourists miss. 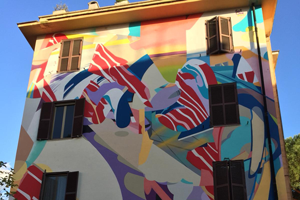 As we drive you through the evocative, narrow streets of old Rome, avoiding most of the main streets, crowded by all kinds of noisy and smelly vehicles, you’ll enjoy and feel the real Rome around you. 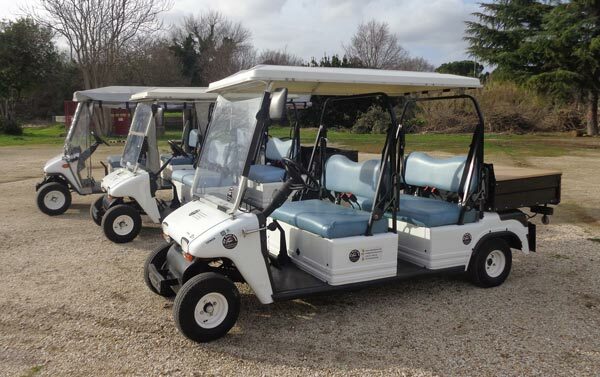 The golf cart tour is ideal for the elderly and disabled, we drive them right to the doorstep of the sites and through areas that wouldn’t otherwise be accessible to them. But kids also have a lot of fun and we never hear the fatidic “are we there yet?”. Last, but not least, the golf cart is ideal to shopping also. We’ll drive you slowly through the streets and let you look at the windows, wait for you while you shop and hold your bags for you. 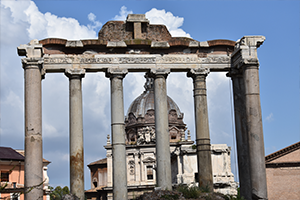 To make your shopping tour more complete, you can also hire one of our expert shopping guides to go along and guide you through the shops of Rome. If you like food instead, you must try our food and wine tours by golf cart. 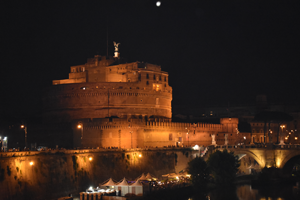 For the food and wine tours, the driver of the golf cart will also be a wine and food expert and he/she will enrich you food and wine experience in Rome. The “deluxe” cart, 4 seats all facing forward! Accommodates 3 + driver and has a large cargo box which can be closed with a lid so you can keep gear in it or the lid can be removed to accommodate the wheelchair or walker for a handicapped passenger. Accommodates 4 passengers plus driver, but one of the passengers faces backwards. This is our 8-seater golf cart! 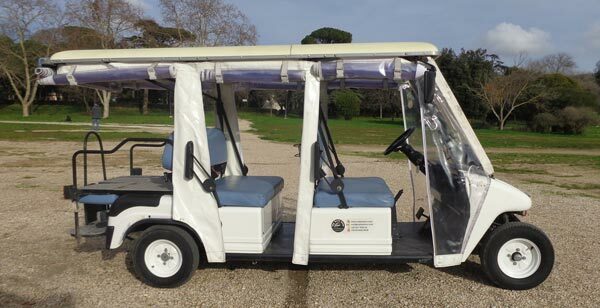 Driving around Rome in this unusual golf cart is a lot of fun. We use it for groups of more than 3 people or for people with special needs. The “Ape”. Old fashioned, typical Italian, this 3-wheeler derives from the world’s most famous scooter, the Vespa. “Vespa” means wasp and “Ape” means bee in Italian. The 3-wheeler version of the Vespa, designed to help men in their work, was named after the industrious insect, the bee. Suggested itineraries for your golf cart tours.